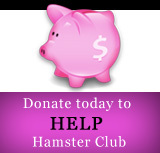 Hamster Club :: Hamster Potty Training! Is hamster potty training possible? Yes it is! Hamsters are clean animals whose natural habit is to urinate in the same spot all the time, usually in a corner of the cage. Start by finding the suitable hamster potty. Some are triangular to fit nicely into a cage corner, others are rectangular. You can make a homemade hamster potty yourself if you prefer making it instead of buying it from a pet store. First find a small, sturdy plastic container with a lid. Then cut a 2 to 3 inch (5 to 7.5 cm) diameter hole in the side of the container. Locate this hole about 1 inch (2.5 cm) above the base (1/2 inch [1.3 cm] for dwarf hamsters) so that litter won�t scatter when the hamster is doing its business! Last, sand the edge smooth for safe entries and exits. A homemade hamster potty might have to be replaced from time to time if the plastic absorbs the urine odor or if the hamster shows any interest in gnawing it. You can also use a gnaw-proof glass potty instead. The great thing about a glass potty is that you will only need a 1-pint (500 ml) wide mouth jar or a � pint (250 ml) jam jar for a dwarf hamster � pop it into a corner of the cage and there you have it! An instant hamster restroom! It�s easy to clean, it�s not a tooth target and it will last as long as your hamster does. Just make sure that the toilet jar is big enough for your hamster to turn around in. 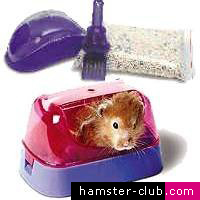 Store bought hamster potties come complete with a little bag of litter and a scoop like shown in the above hamster potty picture. 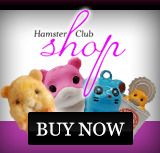 After choosing the hamster�s potty, the next step is for your hamster to pick out the spot for his lavatory. Be patient. Don�t put the litter box into the cage until your hamster christens a corner. When the potty is in place, the potty training can begin. Cover the bottom of the potty with litter and add some urine-soaked bedding along with a few droppings. As soon as your hamster is awake, place him at the outhouse opening of the hamster's potty so that he can get a whiff of what�s inside. His natural instinct should take over when nature calls and prompt him to step right in to relieve himself. Never ever force your hamster into the potty. Most hamsters eventually catch on.